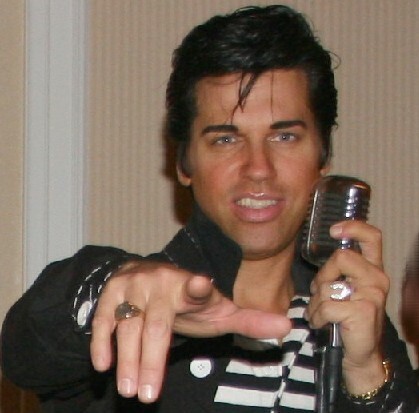 Celebrity Impersonator in Atlanta Georgia - YOUNG Elvis & The Blue Suedes Rockabilly Tribute! YOUNG ELVIS & THE BLUE SUEDES ROCKABILLY TRIBUTE! YOUNG Elvis & The Blue Suedes Rockabilly Tribute Show! VINTAGE Instruments, Microphones, Sound, Look & Worldclass Musicians! Nobody has played like we do since Elvis in 1956! TURNKEY Shows for up to 2500 People! Backline and Lighting Included! Will Travel WORLDWIDE! We play Casinos, Performing Arts Centers, Festivals, Corporate Events, Private Parties, Charity Functions, City Festivals and More! Located in Atlanta, Ga but travel Extensively! ONLY Show of it's Kind in the USA!